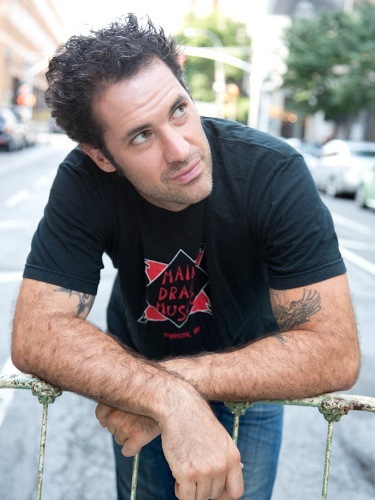 Actor Johnny Depp describes musician/ author Mishka Shubaly as "forever a favourite – sublime!" If Johnny is a fan, he must be worth checking out – which is exactly what we can do as Mishka embarks on his Let Me Back In tour on May 4, 2017. Following the opening show in Wakefield, the Canadian singer/songwriter (pictured above) calls in at The Duke William in Stourbridge on May 5 to entertain with, he says, his "collection of depressing, alcoholic, nihilistic songs". In truth, he's celebrating the release of his new live album, Never Touring Again, recorded in Memphis, and the 10th anniversary re-issue of his debut album, How To Make A Bad Situation Worse, which has been remastered at Abbey Road studios. It contains the intro music to the Doug Stanhope Podcast, Don't Cut Yr Hair, while the song Only One Drinking Tonight is featured in the movie, The Unbookables. As a pointer to what's on offer, Classic Rock Blues observed: "His brand of self-loathing bar-floor blues is about truths that are never pure, rarely simple, and often darkly amusing". Blues In Britain hailed his "brutally frank dispatches from the gutter". As well as writing and performing music, Mishka is a celebrated best-selling author with six number one Kindle Singles (e-book novellas), translated into four languages with nearly 200,000 units sold. His current hardback book, I Swear I'll Make It Up to You, chronicles his battles with drink and drugs and his redemption through extreme long distance running – 50 or 60 mile all-terrain marathons. Now clean and sober, and teaching at Yale Summer Session, Mishka says he's looking forward to visiting the UK again. May 28: Bell Pub, Bath. Why? The chance to see Mishka Shubaly before he 'never tours again'.